Have you ever walked through the aquarium and wondered what life is like for the fishes when they don’t have hundreds of eyes on them? The Shedd Aquarium in Chicago is giving families an opportunity to answer this question by observing the animal behavior that takes place after hours during their Asleep with the Fishes overnight. It sounds like fun but, since I’m homebound with a newborn, I can’t attend so I’m doing the next best thing…offering you all a chance to attend one of the overnights with your family. I’ve partnered with the Shedd Aquarium to give away a family pack of tickets for an upcoming Asleep with The Fishes overnight so read on to learn more and find out how to enter! Asleep with the Fishes is an unforgettable experience for families that includes access to explore any of the open exhibit spaces to observe the nocturnal animal behaviors. They also have scheduled activities like aquatic presentations and hands-on science & animal activities. As the night continues families can enjoy late night movies, games, and snacks before it’s time to roll out your sleeping bag and drift to sleep amongst the fishes. It sounds like an event the whole family will enjoy! 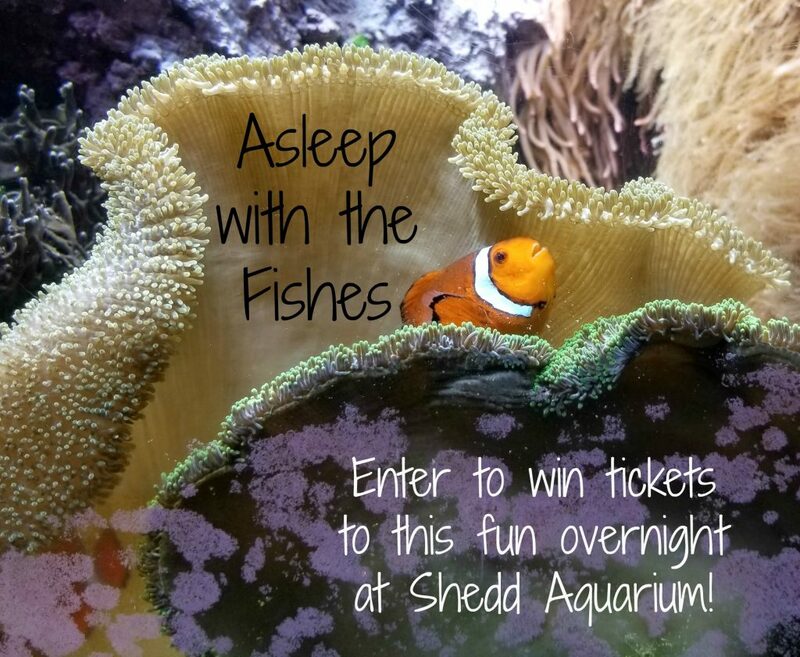 I’ve shared a few important details below but many more can be found on the Shedd Aquarium’s site so please make sure to read the FAQ page for Asleep with the Fishes fully before entering this giveaway and/or purchasing tickets. Times: Doors open at 6pm on those Fridays and the event is over at 8:30am, Saturday. Who can attend: Families and groups with children ages 12 and under are invited to attend Shedd overnights. Children must be 5 or older to spend the night. One adult must attend for every five children, and one child must attend with every three adults. Families with younger children may purchase special evening tickets that let them explore open exhibits and enjoy activities and presentations until 11 p.m.
All overnight tickets include breakfast and a late- night snack. Admission to the aquarium on Saturday is also included in the overnight packages! The VIP tickets let guests sleep in premium locations and also permits them to bring one twin-sized air mattress per one or more people and one queen-sized air mattress per two or more people. Disabilities: Shedd Aquarium’s Accessibility Guide can be found here. Be sure to check out their sensory friendly app if you are attending the event with someone who has Autism or sensory concerns.